Last weekend, with the weather set fair, myself and a couple of friends decided to use the two days to hike the ‘best bits’ of the Wicklow Way and spend Saturday night camped out in the hills. Any cursory glance at the maps will quickly reveal that the Wicklow Way stays predominantly to the east of the range, avoiding nearly every summit as it does so. In addition it spends a good deal of time on the coniferous forest tracks, and a fair bit of the remainder on tarmac roads. So where is the best bit? 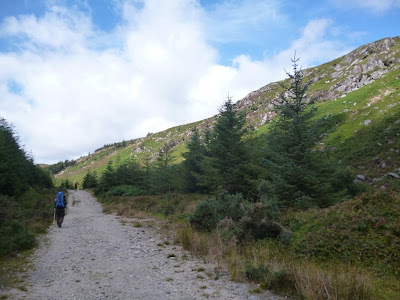 Undoubtedly, the section from Crone wood, past the Powerscourt waterfall and on to the slopes of Djouce, and then over the White Hill to Pier Gates is very pleasant, ( it does go over the summit of White Hill, but this is hardly a major top). The rest of the route subjects the traveller to dark forest track or busy road with none of the wide sweeping views of sea, hill and moorland that the Wicklow Mountains can justly lay claim to, and I cannot help but think that the route planners really missed an opportunity here. Surely one or two accessible ridges would make for a better hiking experience? 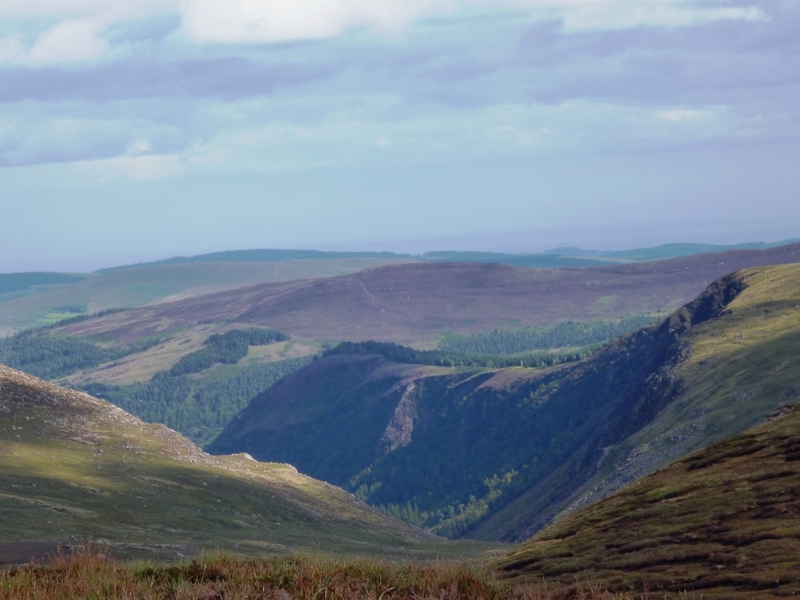 Why not take in Scarr instead of the road section to Laragh, or the Mullacor/Corrig ridge that seperates Glendalough from Glenmalure? Why can we not give the many hiking visitors to these hills a sample of the stunning views to be had? Maybe there were access issues, or perhaps safety concerns, but these hills are no Macgillycuddy’s Reeks, there are few steep drops or serious navigational challenges, and they can be easily avoided by thoughtful route selection. So we gave up on the idea of sticking to the Wicklow Way, and spent the two days meandering over hills and ridges. The sun shone as we took in the summits of Corrig, Lugduff and Scarr, enjoying the wonderful views down into Glendalough and across the rounded granite mountain tops to the west. We crossed the lovely wooded valley of Glenmacanass and gazed down on the curvaceously shaped Lough Dan. We looked out to the pointed Sugarloaf and the sea beyond and we picked out the prominent mountain tops of Lugnaquilla and Tonlagee. 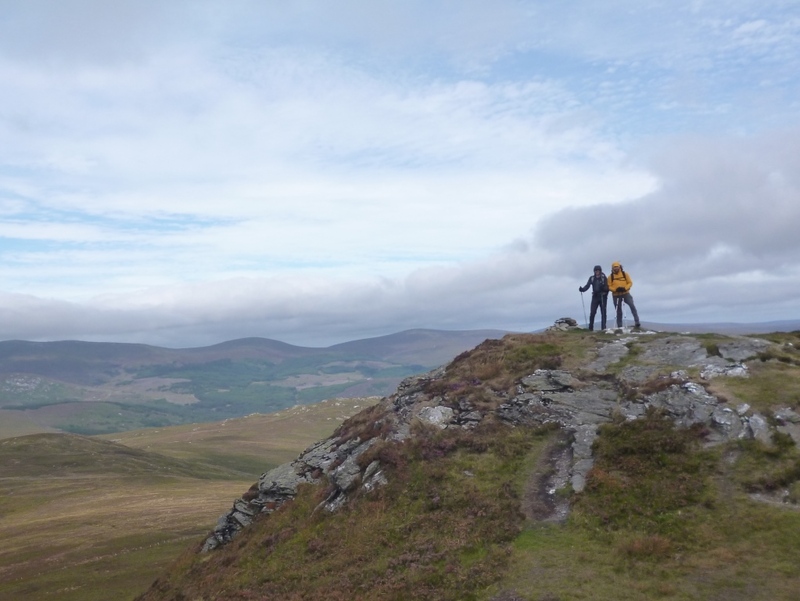 And so I hope many more of our visitors will eschew the Wicklow Way for the wider vistas of the whaleback ridges and rolling hills of this lovely part of Ireland.